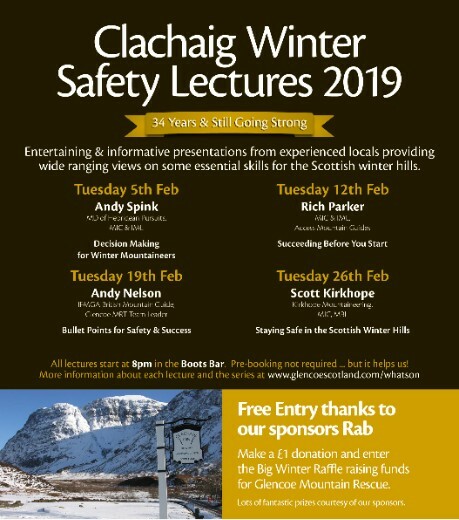 The Clachaig Winter Mountain Safety Lectures run every year, on Tuesday nights through the month of February. Held in the Boots Bar in the Clachaig Inn, Glencoe, the lectures are intended to provide a last minute reminder of some of the preparations and skills to have to hand before venturing into the Scottish winter hills. The lectures were initially set up by then Landlord Peter Daynes in conjunction with Andy Fanshawe, who was National Officer at the BMC. It was seen as an important measure to try and improve mountain safety, especially as many people were arriving in the glen having travelled long distances and keen to go out come what may, without any immediate knowledge of local conditions. One of the underlying principles was that they must be delivered free to audiences. The talks have been delivered every year since 1985, and since 2014 they have also been used to raise funds for mountain rescue and other causes. Over the last five years, the Big Winter Raffle has raised �10807.22 for a variety of causes: for the Glencoe Mountain Rescue Team and to set up the Glencoe Mountain Avalanche Transceiver Park, and the local villages public access defibrillators fund. This year the lecture sponsors are Rab, which is also putting up some prizes for the raffle, with tickets on sale on talk nights. The series opens this year with Andy Spink, founder and MD of Hebridean Pursuits Ltd, talking on the evening of 5th February on Decision Making For Winter Mountaineers. Rich Parker, of Access-Mountain will be up on 12th February, with a talk titled Succeeding Before You Start. On 19th February, Andy Nelson of Infinity Mountain Guides will talk on Winter Mountaineering: Bullet Points for Safety and Success. And on 26th February Scott Kirkhope of Kirkhope Mountaineering will wind the series up with Staying Safe in the Scottish Winter Hills.